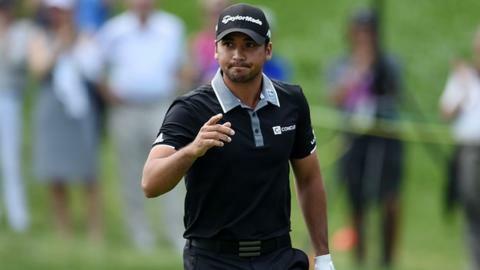 Australia's Jason Day held off the challenge of Kevin Chappell to win the Arnold Palmer Invitational by one shot. US PGA champion Day sank a 12-foot putt for birdie on the 17th and rescued par from the bunker on 18 to finish with a two-under-par 70 and 17 under total. American Chappell finished on 16 under after also hitting 70, while England's Paul Casey (69) and Justin Rose (73) tied for ninth on 10 under in Orlando. "There was not one shot today where I was comfortable," Day said. The Australian, who dropped shots at three of his first six holes, added: "I tried to be as deliberate as possible, which worked out well on the back nine for me, but not on the front nine. "I was out of my zone, as shown by two bogeys on the par fives." Day, who rises one place to replace Northern Ireland's Rory McIlroy at number two in the world rankings with the victory, begins his quest for back-to-back major championships at the Masters on 7 April. McIlroy closed with a seven-under 65, despite a double-bogey on the 14th, to finish 11 shots adrift of Day on six under. "It's a nice way to round off the week," he said. "I just need to eradicate my mistakes. "I just can't beat myself up mentally; that's something that I have done this week. "I've really beaten myself up for hitting bad shots and making mistakes and I can't do that because you can compound one mistake with another and then you get into a bit of a lull where you play a bad nine holes and you just can't afford to do that." Day, Chappell and Sweden's Henrik Stensson shared the lead at 16 under with five holes to play, and Chappell edged ahead when he birdied the par-five 16th, but Day responded with a birdie on 17. Chappell then came up short from 25 feet for par on the 18th after finding the rough, and Day kept his nerve on the same hole by a sinking a four-foot par putt following a 30-yard chip from a bunker.